Christmas is a wonderful time. The most wonderful time, some would say. Doesn’t everybody just seem much more friendly and open to connecting? 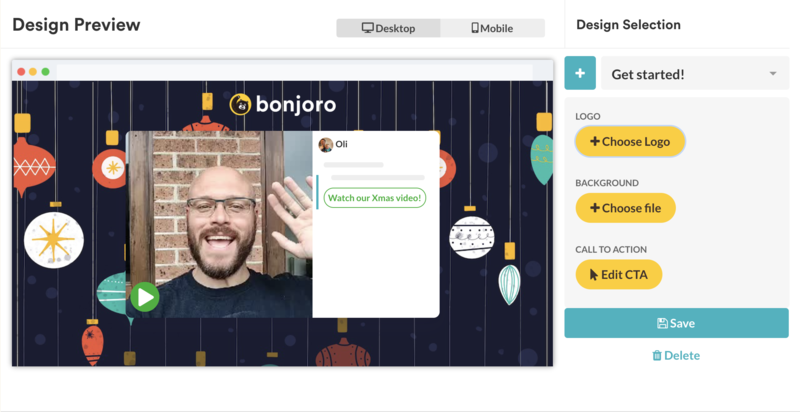 This year we’re here to help you level up that connectivity and scale your efforts to delight your customers and contacts, by sending Christmas Bonjoros. Here's an example that our dev Mike sent out last year. - Revel in amazing feedback and genuine surprise from recipients. Just another boost to your Christmas spirit! Please note: Multi-designs is only available to customers on our $45 Sleuth plan - if you are on the single design $25pm Grizzly plan, updating your design will update all of your subsequent Bonjoros until you change your design back. Head over to the Design tab in your Bonjoro web account, and click “Choose File” under “Background”. Then upload one of the festive backgrounds we created for you here, or find one of your own via a quick Google search. Once you’re happy with the background, think about editing your Call-To-Action. 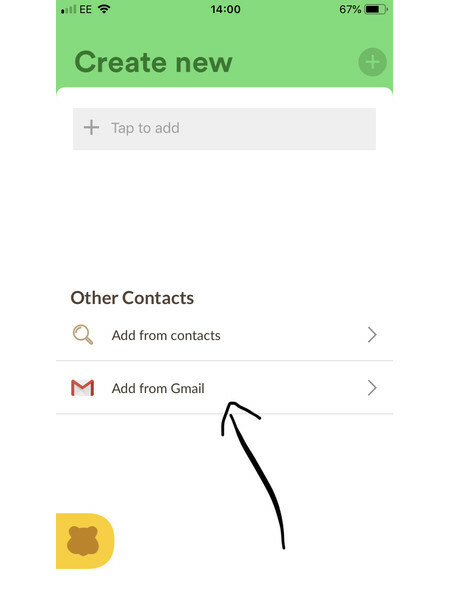 The CTA in the screenshot above shows how you could link the recipient to your Christmas video, e.g. “Watch our Xmas video!”. Here’s a few fun ideas for your own CTAs. It could be anything. But the medium of delivery elevates the experience of receiving the gift to completely new heights. If you have an existing spreadsheet you can upload them to Bonjoro via CSV like this. Now here is the cool bit. 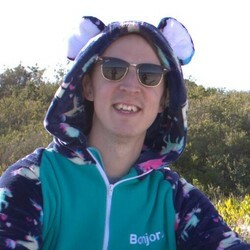 You can now add a reason for sending this Bonjoro, so you or your team members can quickly tell it’s a Christmas Bonjoro. As above, when you set up your automation, you can give it a reason like "Christmas Bonjoros", so you can easily identify your Christmas To-Dos vs. any others you are already sending with Bonjoro. That’s it, you’re all set. Just get sending and wait for the love to pour back in from delighted customers! “Good to hear from you, Merry Christmas”. Good luck with your festive Bonjoros. 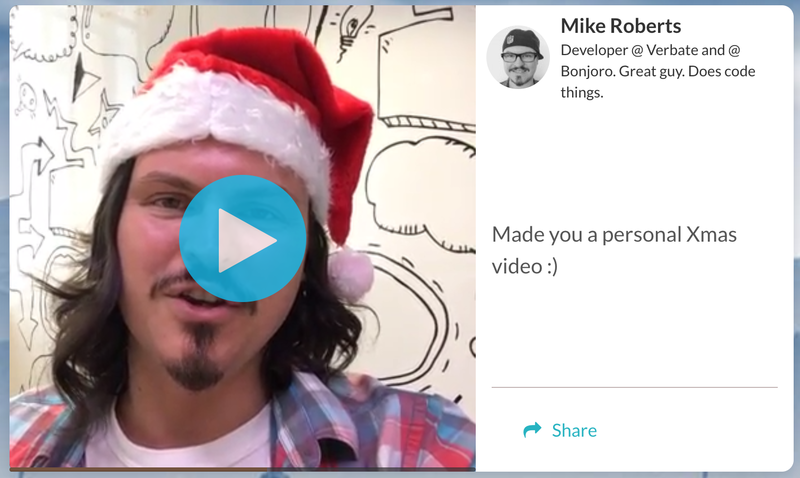 If you'd like to send some festive cheer to the Bonjoro team (and who wouldn't? ), we'd be chuffed if you ping one to earth@bonjoro.com or tweet us @bonjoroapp.